The assault was conducted in two phases: an air assault landing of 24,000 American, British, Canadian and Free French airborne troops shortly after midnight, and an amphibious landing of Allied infantry and armoured divisions on the coast of France commencing at 6:30 am. 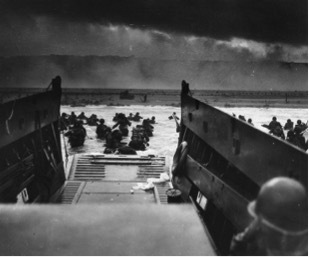 The operation was the largest amphibious invasion of all time, with over 175,000 troops landing on 6 June 1944. 195,700 Allied naval and merchant navy personnel in over 5,000 ships were also involved. The landings took place along a 50-mile stretch of the Normandy coast divided into five sectors: Utah, Omaha, Gold, Juno and Sword. The “Atlantic Wall”, the line of defences planned along the coast of Western Europe from Norway to Spain, was in truth a myth. Only in the Pas de Calais area was it anything like its intended form. In November 1943, Hitler appointed Field Marshall Erwin Rommel to command Army Group B in France, under Field Marshall von Rundstedt who was Commander in Chief in Western Europe. Rommel saw the weaknesses in the “Atlantic Wall” and knowing that any invasion would have to be stopped at sea or on the beaches, he set about his task of strengthening the defences. Though far from complete by 6 June, these defences included formidable gun batteries, fortified positions, machine gun bunkers, minefields and beach defences. Both Von Rundstedt and Rommel were convinced the invasion would take place in northern France, but both had very different views on how to meet it. Von Rundstedt did not think the Atlantic Wall could be held for very long against the size of the invading force expected for the assault. Von Rundstedt wanted to hold the Armoured Divisions (Panzer Group West), back inland until the exact landing areas of the Invasion could be established; he then planned to execute a massive counter attack to drive the Allies back into the sea. Rommel totally disagreed with the plan; he knew that once the Allies fought their way off the beaches and established a firm footing in France, they would never be pushed back. Unlike von Rundstedt, Rommel wanted to place the whole of Panzer Group West as near to the beaches as possible. He repeatedly said the allied invasion had to be stopped before it could get off the beaches. The argument was eventually brought before Hitler for arbitration. He characteristically imposed an unworkable compromise solution. Only three Panzer divisions were given to Rommel, too few to cover all the threatened sectors. The remainder were held in reserve. Only three of these were deployed close enough to intervene immediately against any invasion of Northern France; the other four were dispersed in southern France and the Netherlands. Hitler reserved to himself the authority to move the divisions in reserve, or commit them to action. On 6 June, many Panzer division commanders were unable to move because Hitler had not given the necessary authorisation, and his staff refused to wake him upon news of the invasion. Operation Fortitude was the codename for the deception operations used by the Allied forces during World War II in connection with the Normandy landings. It was divided into Fortitude North, a threat to invade Norway, and Fortitude South, designed to induce the Germans to believe that the main invasion of France would occur in the Pas de Calais rather than Normandy. The principal objective of Fortitude was to ensure that the Germans would not increase their troop presence in Normandy, which it achieved by promoting the appearance that the Allied forces would attack German positions elsewhere. Equally important was the plan to delay the movement of German reserves to the Normandy beachhead and prevent a potentially disastrous counterattack. The plan therefore aimed to convince the Germans that additional assaults were planned—specifically in Scandinavia and in the Pas de Calais. To mislead enemy reconnaissance aircraft, fake infrastructure and equipment, such as inflatable rubber tanks and plywood artillery, were created. Controlled leaks of information were made through diplomatic channels, which might be passed on via neutral countries to the Germans. To create the impression of a large force based in Kent, wireless traffic was created to simulate actual units. German agents controlled by the Allies were used to pass on false information to the German intelligence services. Notable individuals commanding phantom armies, most notably George S. Patton the best known senior Allied combat commander, appeared in public. During the course of Fortitude there was almost complete lack of German aerial reconnaissance. Together with the absence of uncontrolled German agents in Britain, came to make physical deception almost irrelevant. The majority of deception was carried out by means of false wireless traffic and through German double agents. The latter proved to be by far the most significant. One notable agent was Juan Pujol (GARBO), a Spaniard operating from Lisbon. He created a huge network of imaginary sub-agents and the Germans unwittingly paid the British Exchequer large amounts of money regularly, thinking they were funding a spy network. He was awarded the Iron Cross by the Germans and an MBE by the British after D-Day. While the real invasion force landed in Normandy, Allied planes dropped silver foil to give the impression on German radar screens of massed planes and ships crossing from Dover. In fact, Fortitude was so successful that Hitler regarded the Normandy invasion as a feint: he kept his Panzer units where he expected an attack and away from Normandy until the battle for Normandy was decided. Only a few days in each month were suitable for launching the operation, because both a full moon and a Spring tide were required. The former to illuminate navigational landmarks for the crews of aircraft, gliders and landing craft, and the latter to provide the deepest possible water to help safe navigation over defensive obstacles on the seaward approaches to the beaches. Allied Expeditionary Force Supreme Commander Dwight D. Eisenhower had tentatively selected 5 June as the date for the assault. Most of May had fine weather, but this deteriorated in early June. On 4 June, conditions were clearly unsuitable for a landing; wind and high seas would make it impossible to launch landing craft and low clouds would prevent aircraft finding their targets. The Allied troop convoys already at sea were forced to take shelter in bays and inlets on the south coast of Britain for the night. It seemed possible that everything would have to be cancelled and the troops returned to shore. The next full moon period would be nearly a month away. At a vital meeting on 5 June, Eisenhower’s chief meteorologist (Group Captain J.M. Stagg) forecast a brief improvement for 6 June. Eisenhower ordered the invasion to proceed. The Germans meanwhile took comfort from the existing poor conditions, which were worse over Northern France than over the Channel itself, and believed no invasion would be possible for several days. Some troops stood down, and many senior officers were away for the weekend. General Erwin Rommel, for example, took a few days’ leave to celebrate his wife’s birthday. While dozens of division, regimental, and battalion commanders were away from their posts, some at war games, the Allied forces were attacked. East of the landing area, the open, flat, floodplain between the Orne and Dives Rivers was ideal for counterattacks by German armour. However, the landing area and floodplain were separated by the Orne River and Orne Canal. The only crossings of the river and canal north of Caen were 4.5 miles from the coast, near Bénouville and Ranville. For the Germans, the crossing provided the only route for a flanking attack on the beaches from the east. The British 6th Airborne Division was to capture intact the bridges of the Bénouville-Ranville crossing (including Pegasus Bridge), to defend the crossing against the inevitable armoured counter-attacks. Its other objectives included destroying the Merville gun battery, which threatened Sword Beach, and destroying five bridges over the Dives River to prevent the Germans moving forces from the east. Airborne troops began landing after midnight on 6 June and immediately encountered elements of the German 716th Infantry Division. In a dramatic “coup de main”, men from The Oxford and Buckinghamshire Light Infantry, landing in six gliders, captured the Orne bridges. In doing so they suffered the first casualty in action on D Day and liberated the first French house. At dawn, forces from the 21st Panzer Division counterattacked from the south on both sides of the Orne River. By this time the paratroopers had established a defensive perimeter surrounding the bridgehead. Casualties were heavy on both sides, but the airborne troops held. Shortly after noon, they were reinforced by commandos of the 1st Special Service Brigade. By the end of D-Day, 6th Airborne had accomplished each of its objectives. For several days, both British and German forces took heavy casualties as they struggled for positions around the Orne bridgehead. The U.S. 82nd and 101st Airborne Divisions, numbering 13,000 paratroopers were less fortunate in completing their main objectives. To achieve surprise, the drops were routed to approach Normandy from the west. Numerous factors affected their performance, the primary of which was the decision to make a massive parachute drop at night. As a result, 45% of units were widely scattered and unable to rally. After 24 hours, only 2,500 troops of the 101st and 2,000 of the 82nd were under the control of their divisions, approximating a third of the force dropped. The dispersal of the American airborne troops, however, had the effect of confusing the Germans and fragmenting their response. In addition, the Germans’ defensive flooding in the early stages, also helped to protect the Americans’ southern flank. Paratroopers continued to roam and fight behind enemy lines for days. Many consolidated into small groups, rallied by NCOs or junior officers, often a mix of men from different companies, battalions, regiments, or even divisions. The 82nd occupied the town of Sainte-Mère-Église early in the morning of 6 June giving it the claim of the first town liberated in the invasion, a claim also made by The British 6th Airborne Division on liberating Ranville. In many ways Sword Beach was the key to success in the Normandy landings. It was the nearest beach to Caen , the capital of the area and the prize that would need to be taken to allow a breakout. The plan was to land the 3rd Infantry Division (‘Monty’s Ironsides’), who would then link up with 6th Airborne Division on the Eastern Flank. The 3rd Division would be assisted in the landings by Lord Lovat’s 1st Special Service Brigade, which also included French commandos. Their opposition would be units from the German 716th Division, with 21st Panzer Division located in the Caen area – a possible major threat if tanks arrived to block the invasion. The landings on Sword Beach began at 7.25am, with the infantry of 3rd Division coming under heavy fire as they hit the beach. However, many Sherman DD tanks (amphibious tanks which could ‘swim’ ashore) had landed successfully and were able to lay down fire support. The commandos were doing well, but encountered stiff resistance as they battled through the streets and bunkers at Ouistrehem. Units pushed gradually inland and neutralised the defences beyond the beach at the Morris and Hillman bunker complexes. 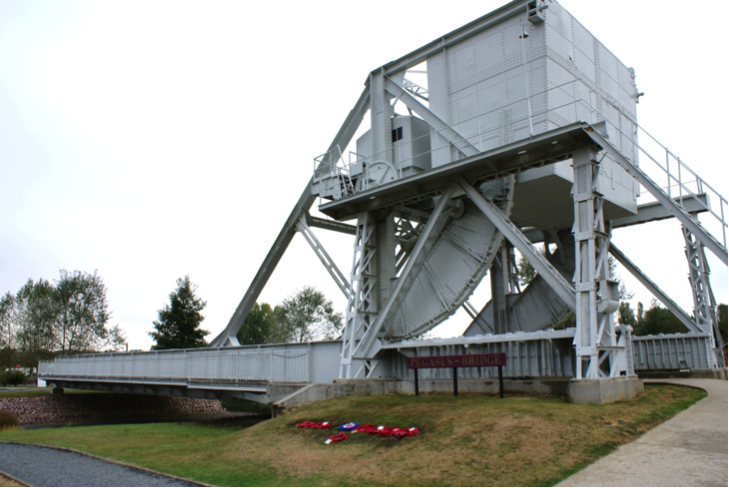 Meanwhile 1st Special Service Brigade linked up with 6th Airborne at Pegasus Bridge, and by late afternoon infantry and tanks from 3rd Division had moved to the Ranville area. 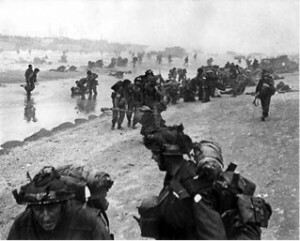 Men from the advance guard of 51st (Highland) Division also began to arrive from the beach. A counter-attack from 21st Panzer Division came in the late afternoon, when a battlegroup advanced on the Perriers Ridge. Although some German units gained sight of the sea, the attack was driven back with heavy losses in tanks, equipment and men. The Germans withdrew to the high ground north of Caen , and the landings at Sword Beach were now secure. But Caen had not been taken – and would not be for some time to come. Juno Beach was the sector allocated to Major General R.F.L. Keller’s 3rd (Canadian) Division, assisted by specialist tanks from the British 79th (Armoured) Division which cleared mines and knocked out pillboxes. The first objective on D Day was to land on the beaches and secure all the villages on the Divisional front. Then next objective was to push inland to a line ending on the Bayeux-Caen road. Despite some localised opposition, the landings generally went very well with minimal casualties and fewer than 400 dead in the entire division. Although some D Day objectives were not reached, in several places Canadian units managed to push further inland than had been planned. Gold Beach was the extreme right landing area of the British and Commonwealth landings on D Day. The 50th (Northumbrian) Division came ashore here between Le Hamel and Ver sur Mer. Attached to them would be elements of 79th (Armoured) Division, equipped with ‘funnies’, tanks equipped for specialist tasks, such as mine clearing and laying mat tracks for vehicles. The pre-invasion bombardment had done its job and the landings had went well. CSM Stan Hollis of the Green Howards carried out a acts of bravery that would see him receive the Victoria Cross – the only man to receive this medal on D Day. Troops pushed inland towards their objectives. Arromanches was taken, which was to provide the site for a Mulberry harbour, and the Longues gun battery was taken the next day. Omaha was also the most heavily fortified beach, with high bluffs defended by mortars, machine guns and artillery. The pre-landing aerial and naval bombardment of the bunkers proved to be ineffective. Difficulties in navigation caused the majority of landings to drift eastwards, missing their assigned sectors and the initial assault waves of tanks, infantry and engineers took heavy casualties. Of the 16 tanks that landed upon the shores of Omaha Beach, only 2 survived the landing. Only a few gaps were blown in the beach obstacles, resulting in problems for subsequent landings. The heavily defended draws, the only vehicular routes off the beach, could not be taken and two hours after the first assault the beach was closed for all but infantry landings. Commanders considered abandoning the beachhead, but small units of infantry, often forming ad hoc groups, supported by naval artillery and the surviving tanks, eventually infiltrated the coastal defences by scaling the bluffs between strongpoints. Further infantry landings were then able to exploit the initial penetrations and by the end of the day, two isolated footholds had been established. American casualties at Omaha on D-Day numbered around 5,000 out of 50,000 men, most of them in the first few hours, while the Germans suffered 1,200 killed, wounded or missing. The tenuous beachhead was expanded over the following days, and the original D-Day objectives were accomplished by D+3. Casualties on Utah Beach, the westernmost landing zone, were the lightest of any beach, with 197 out of the roughly 23,000 troops that landed. The 4th Infantry Division troops landing at Utah Beach found themselves in the wrong positions because of a current that pushed their landing craft to the southeast and many came ashore in sectors which were lightly defended. The 4th Infantry Division was able to press inland relatively easily over beach exits that had been seized from the inland side by the 101st Airborne Division. Casualties were light, and the troops were able to press inward much faster than expected, making it a near-complete success. The Mulberry Harbour’s purpose was to ease and speed up the unloading process so that Allied troops were supplied as they advanced across France after breaking out from Normandy. The success of D-Day could only be maintained if the advancing troops were supplied and more men landed. Allied commanders were convinced that without a harbour the invasion would fail and French harbours were heavily defended by the Germans. The Mulberry Harbour was one of the greatest engineering feats of World War Two. The Mulberry Harbour was actually two artificial harbours which were towed across the English Channel and put together off the coast of Normandy. One, known as Mulberry A, was constructed at Omaha Beach and the other, known as Mulberry B, nicknamed ‘Port Winston’, was constructed off Arromanches at Gold Beach. When both were fully operational, they were capable of moving 7,000 tons of vehicles and goods each day. Each of the two artificial harbours was made up of about six miles of flexible steel roadways which floated on steel or concrete pontoons. The roadways were codenamed “Whales” and the pontoons “Beetles”. The ‘Whales’ ended at giant pier heads that had ‘legs’ that rested on the seabed. The whole structure was protected from the force of the sea by scuttled ships, sunken hollow concrete caissons and a line of floating breakwaters. The material requirements for any part of either Mulberry A or B were huge – 144,000 tons of concrete, 85,000 tons of ballast and 105,000 tons of steel. The various parts of the Mulberry harbours were made around Britain in the greatest of secrecy. 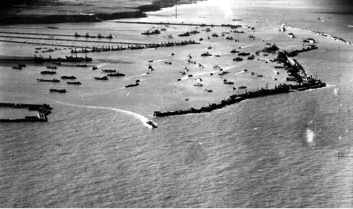 The many various parts were towed across the Channel to Normandy immediately after 6 June. By 18 June, both harbours were in use. They were meant to stay in use until the capture of Cherbourg. However, a violent storm begun on 19 June. By 22 June, the harbour serving the Americans at Omaha had been wrecked. Parts of it were salvaged to repair the British harbour at Gold Beach which worked for 10 months. In that time this harbour landed 2.5 million men, 500,000 vehicles and 4 million tons of goods. The Germans had been taken by surprise and the Allies had secured a series of bridgeheads along the Normandy coast across a front of 30 miles. Over 100, 000 troops had been landed. However, many of the first day objectives had not been secured. There had been a failure to join up the bridgeheads and a gap of seven miles existed between the British and Americans. The bridgehead at Omaha was very shallow and Caen had not been captured. Casualties were over 10,000, the worst being suffered by the Americans at Omaha. Some 3000 French civilians were also killed. However, Rommel’s prediction was to prove correct. Once established, the Allies quickly built up the number of men and military resources available to them. After fierce fighting in Normandy, the Allies broke out of Normandy by the end of July and began the series of campaigns which resulted in the liberation of Western Europe.